Bee-keeping is an integral part of farm bio-diversity and every farmer must practice it sincerely. 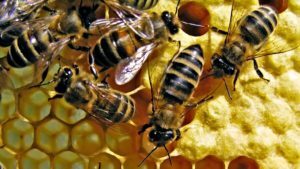 There are more than one ways to earn in bee-keeping. Converting worker larvae into queen is called as Queen Grafting. To do so first and foremost a queen cell is prepared. Then after small worker larve are removed from eight cells and thrown. The royal jelly from these eight cells is collected and put in the man-made queen cell cup. Once the queen cell cup is ready with the royal jelly, we take 24-36 hours old queen laid egg and put it inside the cell cup. Finally the bee-queen cell is placed in a colony that develops as queen. We usually graft 30-40 eggs out of which atleast 35 queens are developed. More the queen, more colonies can be developed. Queen grafting is a delicate process and needs time and patience to master it. I have 1,500 bee boxes with colonies and 4,000 empty. I manufacture and sell these bee boxes. When sold with the colonies the money earned is more yet empty boxes fetches good money too. I make boxes with cane, bamboo, wood, earthen pot, plastic or fiber. Bees enhance pollination in pomegranate, almond, watermelon and cucumber farms etc. Farmers get good yield as rate of pollination increases with bees. The plants start bearing more flowers after pollination. In addition the farmland soil becomes fertile with pee and poo of bees. The pH of the soil also improves. I first inspect the fields before keeping the boxes to ensure the crops are free from diseases. I keep boxes where there is no chemicals sprayed for atleast 1km distance. Along with individual farmers we also work with seed manufacturing MNCs. They approach us to increase the pollination. Seed companies pay us Rs. 1200/month. They take the boxes and bring it back to us. In case of some damage the cost is borne by them. They take minimum 700-800boxes. 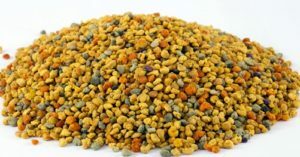 We sell bee pollen to Ayurvedic companies. Selling price of pollen varies on the basis of flowers. Its’ demand is increasing day by day as awareness on its’ benefits is increasing. Pollen trap gate is used to collect pollen. 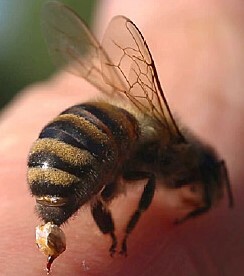 When the bees enter the box, the pollen falls down in the trap and it is then collected. As pollen is food for the bees I collect pollens only once in 10days. I keep the trap gate before the box once in 10days and for the rest of 9days pollen is left untouched for the bees. Royal jelly and beeswax are also sold at premium price. Besides I also prepare and sell value added products from by-products such as pollen powder (mixture of pollen and ashwagandha. It is given to the children to boost their memory power, royal jelly body tonic for chest, pollen aloe vera face cream, beeswax crack cream and beeswax candle etc. Arthritis can be treated with bee sting. This treatment is known as “Ambuchikiste” wherein the sting from the bee is removed and pricked on the arthritis affected area. The sting releases venom rich in antibiotic, pain relief and anti-inflammatory properties. Many foreigners and Tibetans regularly come for this treatment. Price charged is Rs. 400/bee. Only one sting is sufficient for one patient. We press the bee and remove the sting. Lastly I produce and sell honey of different varieties such as jamoon, soapnut, mardi balli (as called in Kannada), sunflower and mustard flowers. I travel to various locations for keeping the bee boxes for honey production. Honey is processed through centrifuge. It will not contain any dirt. Honey is harvested from the bee box once in a month. Approximately 3-4kg honey is obtained from one box. Honey is sold at different prices based on the flower source such as mardi balli honey @ Rs. 1500/kg, jamoon @ Rs. 800/kg, soapnut @ Rs. 1200/kg, sunflower @ Rs. 250-300/kg, mustard @ Rs. 900/kg and multiflora honey @ Rs. 500/kg. I even make value added products from honey like honey jam, honey infused with herbs, honey with dry fruits etc. Apart from the regular honey, I also sell comb honey procured from multiflora. Honey present in the comb along with beeswax is sold as it is. People buying this, cut and eat the comb just like cake. They eat the comb and honey and later spit out the beeswax (same as seeds are spit out while eating fruits). Comb honey is sold at Rs. 1000/kg as it is medicinally rich and pure. In future I want to scale the operations by including more farmers in my network. I want to sell bee boxes and colonies to them and later buy-back their bee-keeping products to resell the same to direct buyers. I recommend bee-keeping because it is the venture that requires less investment and gives high profits. It will never lead to loss!